St Marylebone Parish Church is an Anglican church on the Marylebone Road in London. It was built to the designs of Thomas Hardwick in 1813-17. The present site is the third used by the parish for its church. The first was further south, near Oxford Street. The church there was demolished in 1400 and a new one erected further north. This was completely rebuilt in 1740-42, and converted into a chapel-of-ease when Hardwick's church was constructed. The Marylebone area takes its name from the church. Here's the our members favorite photos of "Churches near City of Westminster". 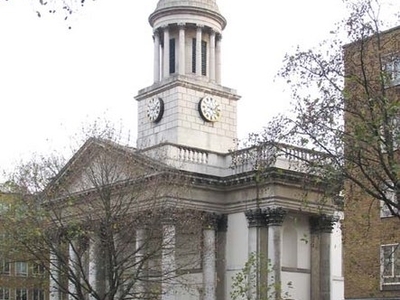 Upload your photo of St Marylebone Parish Church!